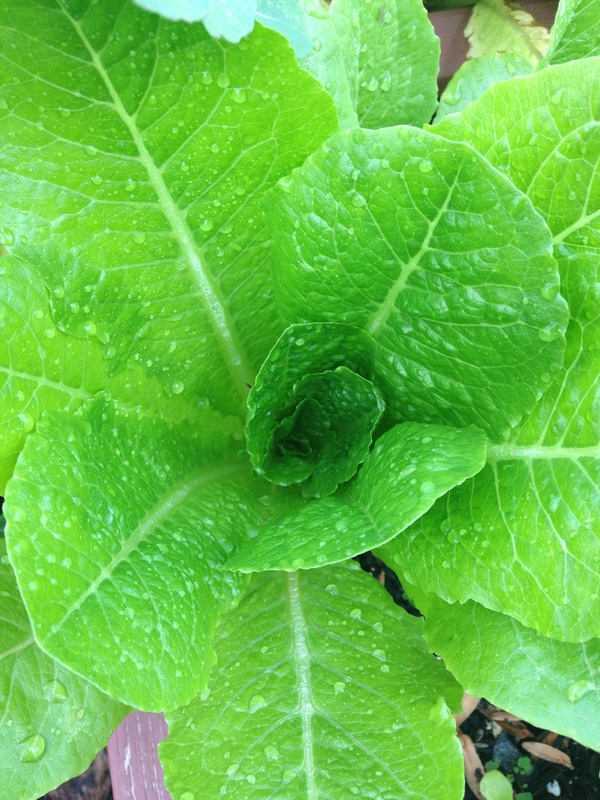 With fresh lettuce still popping up in the garden we like to indulge in our leafy greens before the cold kills them off! I love salad but it is easy to get bored with your traditional everyday salads! I am really good at wearing out dishes in the kitchen! Actually, I am good at wearing just about anything out…. a new song, a new recipe, a new workout! You get my drift. Anyways, this salad is a nice change from your traditional salads you might make. Step out of the box a little bit and be adventurous! I think you will be pleasantly surprised! It’s a bright, colorful, tasty and different! But a good different! 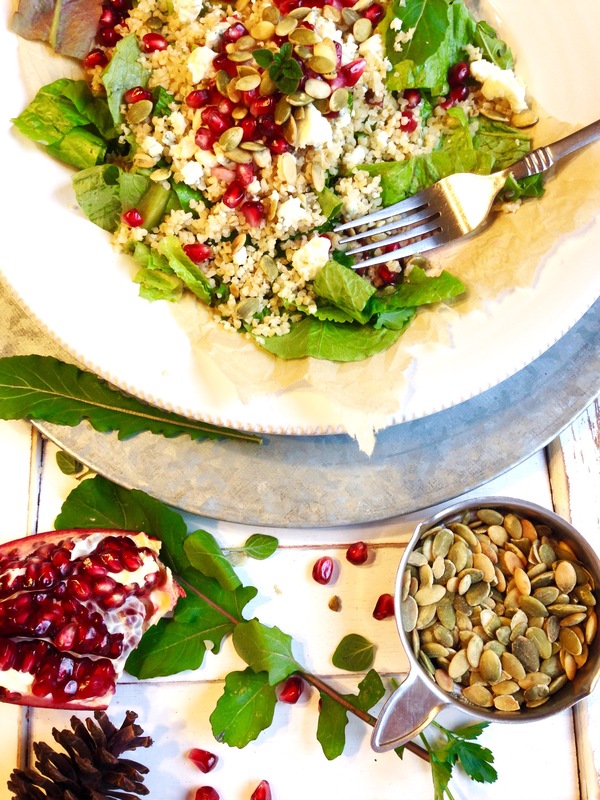 I love the pomegranate arils in this salad, with each bite they burst with juicy sweetness! 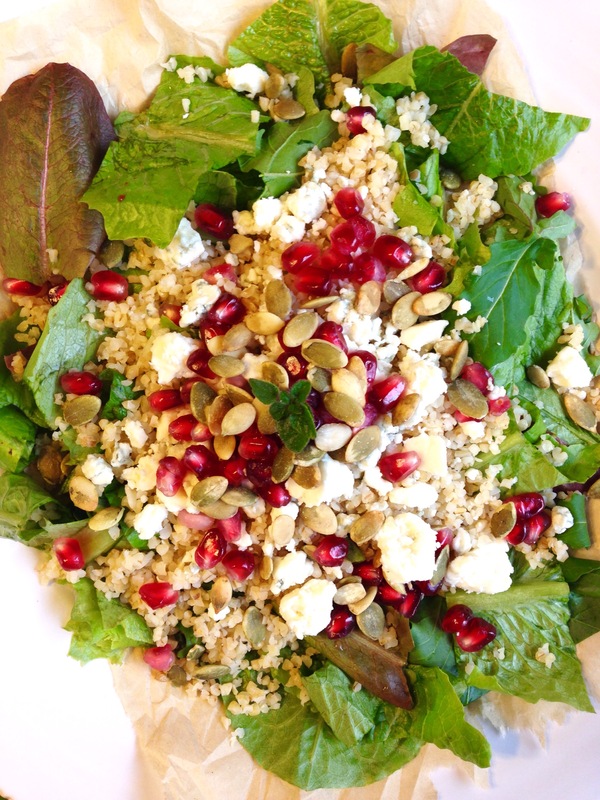 The peppery arugula from the garden goes wonderful with the nutty bulgur wheat. Bulgur wheat is a dried cracked wheat common in European and Middle Eastern cuisines. You could of coarse substitute the bulgur wheat for quinoa or even chicken. The pepitas (which is just another word for shelled pumpkin seeds) give the salad a nice crunch. 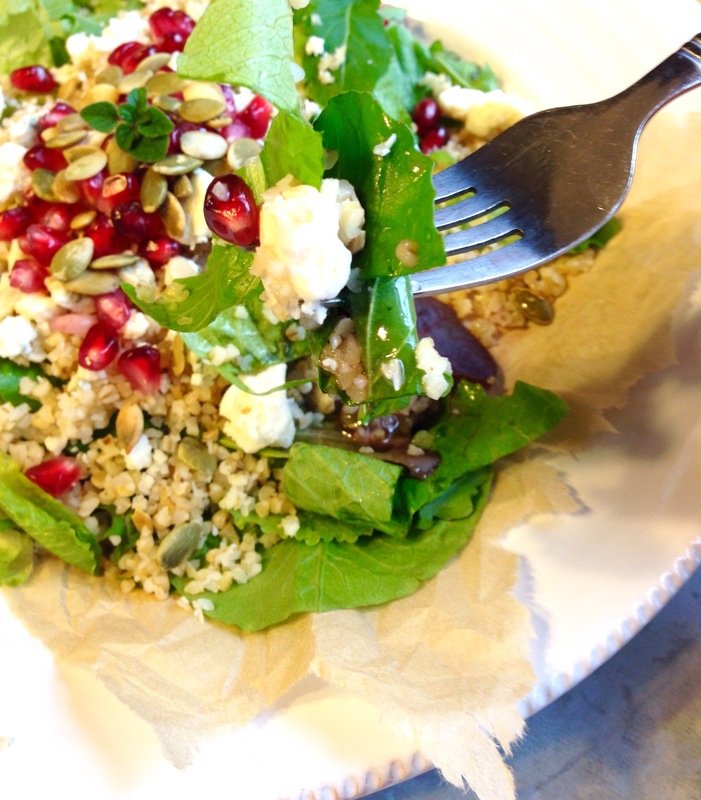 The feta cheese is a nice salty addition to this salad! 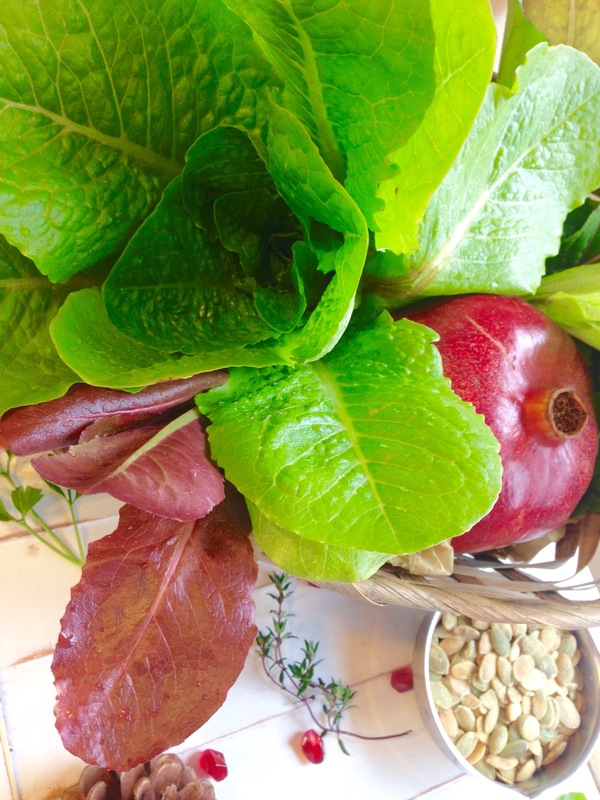 Now the vinaigrette…. SO GOOD! And so easy! The pomegranate juice gives it a nice sweetness! I love whipping up a quick salad dressing in a mason jar with olive oil, some sort of vinegar then adding some chopped herbs from the garden, shake and pour! Simple as that! 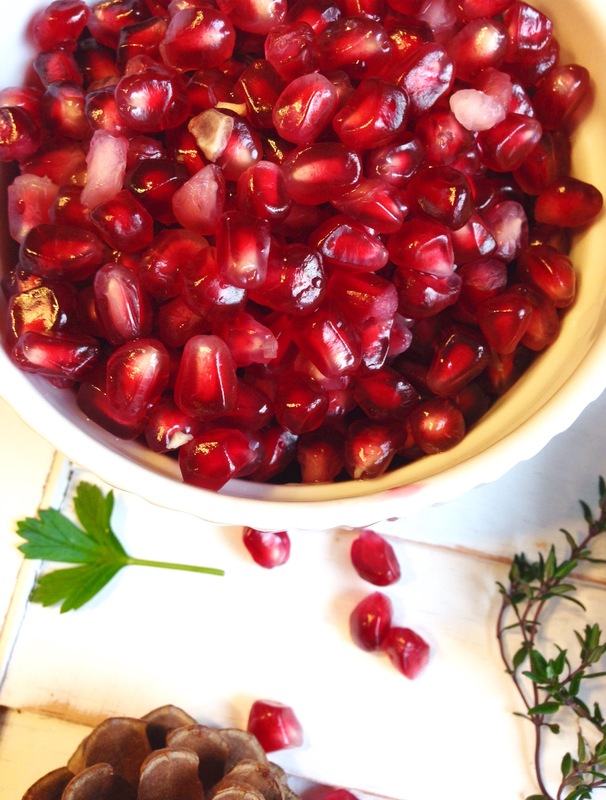 1.Start by cutting the top of your pomegranate off then slice four slits around the pomegranate from top to bottom. Pull apart your pomegranate. The slits will make this easier. 2. 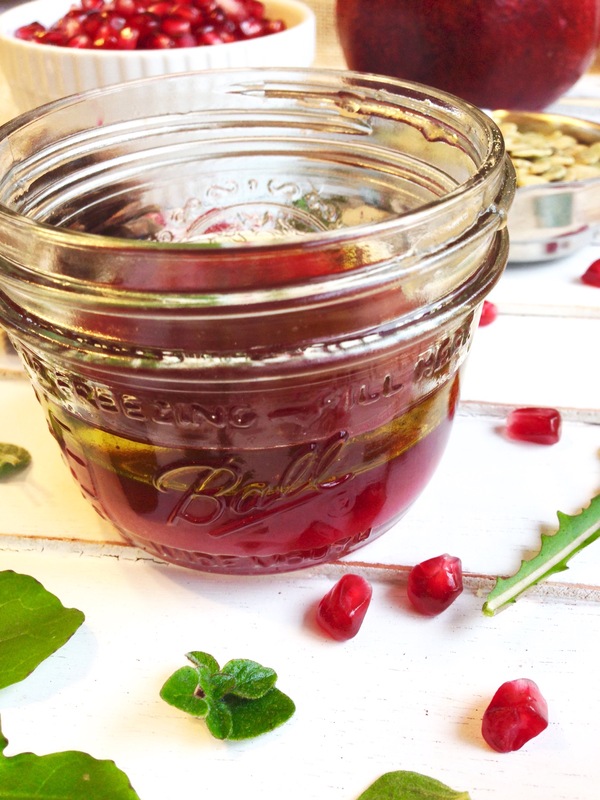 Take slices of the pomegranate and over a 1/2 cup measuring cup squeeze the pomegranate allowing the juice to fill the cup full. Set aside. 3. Fill a medium size bowl with warm water and with your hands gently remove the arils over the bowl. You will notice the arils will sink and the membrane around them will float. Discard of the membrane and strain the arils threw a strainer. Set aside. 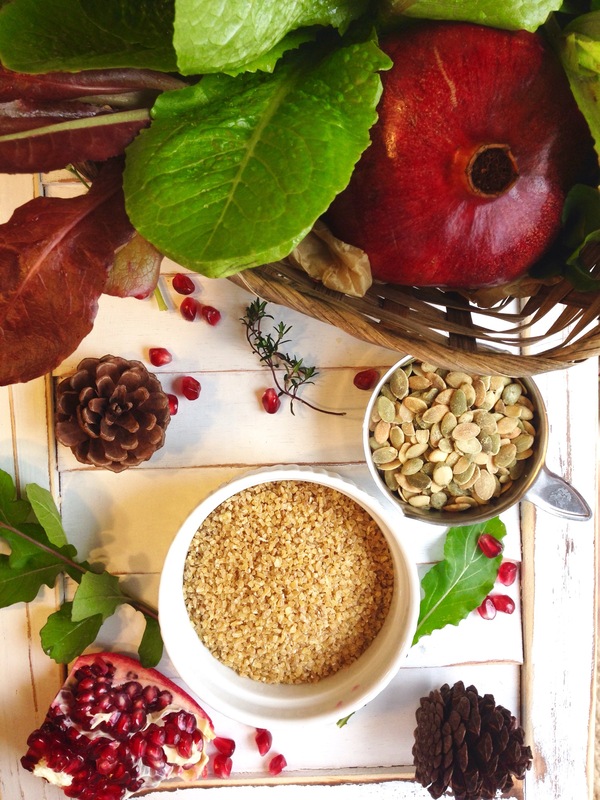 If your still confused on how to get your arils out of your pomegranate checkout Half Baked Harvest’s Tutoral on how to deseed a pomegranate, here is the link. I found this helpful! While you’re there check out some of her amazing recipes! She is a REAL talent in the kitchen! 4. In a sauce pan prepare bulgur wheat according to instruction on the package. I prepared one cup. You can of coarse cook more if you so choose. Set aside. 5.Wash romaine and arugula and chop. Place in a bowl. 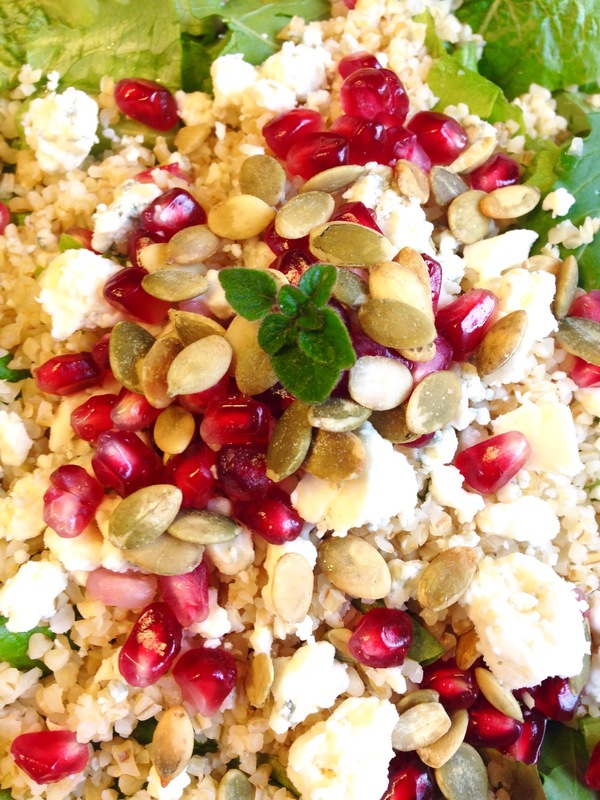 Then top with bulgur wheat, cheese, pomegranate arils and peptias. 6. Poor the pomegranate juice into a mason jar. Chop herbs then add herbs, sherry vinegar, olive oil, salt and pepper to mason jar. Place the lid on the jar tightly and shake until mixed. 7. Once you are ready to serve pour the dressing over the salad. TIP: If you have extra dressing you can store in the fridge for up to three days in the mason jar. This salad is healthy and savory! The different flavor combinations are sure to keep your taste buds happy and change things up a bit! 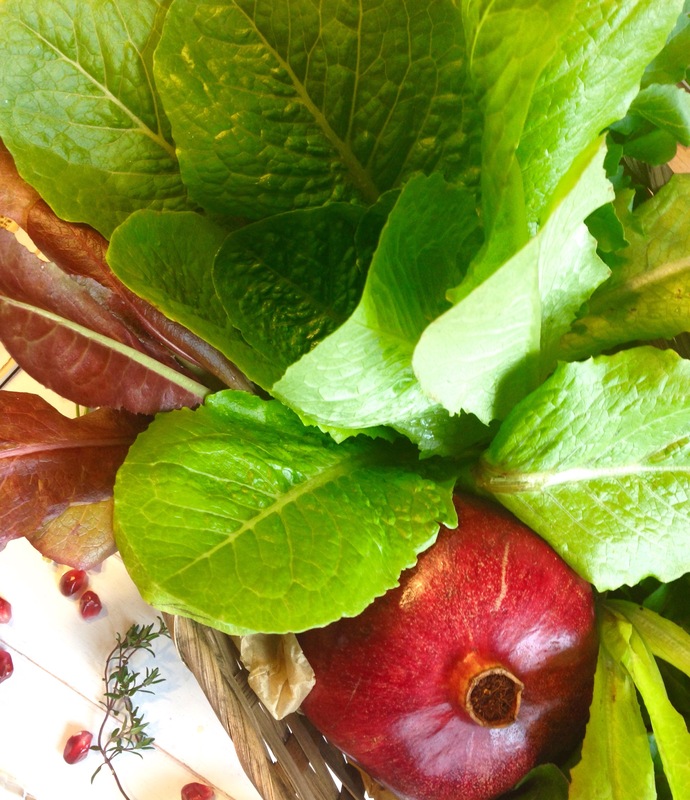 This salad is a great way to use those beautiful greens and aromatic herbs from the garden! 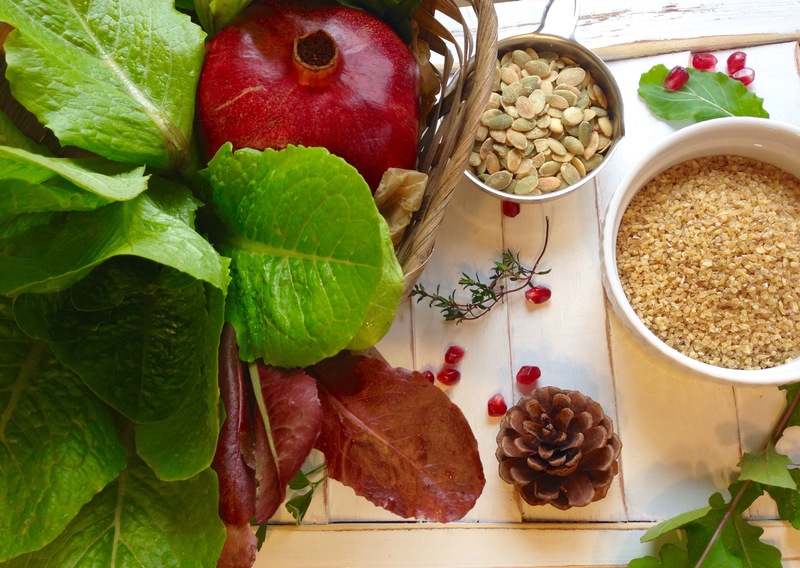 Plus we all know we could use some more salads with the holidays upon us! Enjoy! Grow it. Pick it. Cook it. Eat it.